The ultimate Autumnal jacket has landed. 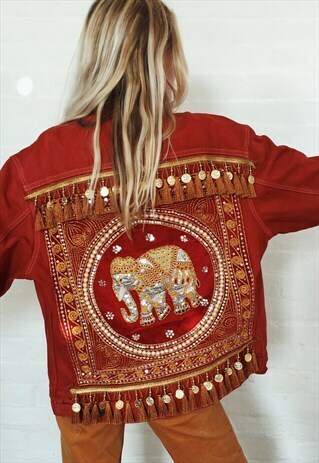 We have designed this vintage denim jacket with embellished upcycled material combined with Indian tassels and coin fringing. Front and chest pockets with button fastening. Can be worn oversized. Model is UK 6/8 for reference and fit oversized. Will fit up to size 12. Brand: Levis Due to vintage condition expect some minor signs of wear. To maintain the quality it was purchased in we advise these not to be machine washed, alternatively hand wash with care in cold water. Handmade with love by co owner Kirra.